Size: 4.3" x 4.0" x 1.1"
• PLT SHH1: Spot Hand Held, first generation PET device with smaller, portrait oriented screen. • PLT SU1: Toto Hand Held, second generation PET device with large, color screen. This PLT VIEW was developed for the PLT SU1 and allows the wireless connection of the Hand Held to a monitor or projector using the IEEE802.11b standard. 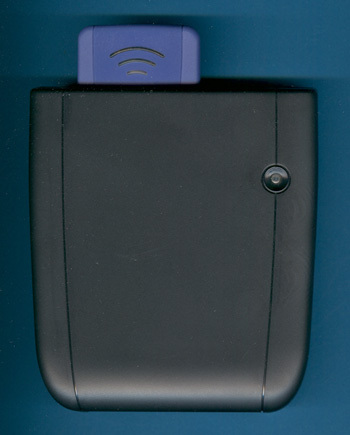 A small port accommodates the PLT-WC Wireless Card and translates to a standard 15-pin HD D-SUB connector used with VGA and SVGA monitors. The backside of the module teases us with some interesting information as a start point of further research: Model No: PLT - VIEW, © 2003, Made in Taiwan and a huge OMAP logo. Disassembling the PLT VIEW reveals indeed a very complex design centered around the modern architecture based on the OMAP architecture introduced by Texas Instruments already in 2001. Processor: The first-generation OMAP™ 5910 combines in one system the TMS320C55x DSP (Digital Signal Processor) with a ARM925 RISC (Reduced Instruction Set Computing) to perform the perfect balance between performance and power consumption for mobile products. While the OMAP™ 1510 used in the earlier PLT SHH1 and PLT FHH1 was developed for PDAs (Personal Digital Assistants) and smartphones, the OMAP™ 5910 was intended for internet appliances and web pads. Flash memory is non-volatile and does not need a battery to maintain the information stored in the chip. In the past years two different technologies emerged in parallel with some advantages and disadvantages. The disassembled PLT VIEW (Manufactured 2003) makes use of one 29LV400TC, manufactured by Fujitsu, Japan with a 256k*16 organization. The disassembled PLT VIEW makes use of one Toshiba TC58128A NAND Flash-ROM with 16M Bytes. SDRAM is the abbreviation of synchronous dynamic random access memory and is used as program and data memory for microprocessor systems. Each bit of data in a SDRAM is stored in separate condensator on the integrated circuit. Since these capacitors leak charge, the information eventually fades unless the capacitor charge is refreshed periodically. During power-up of the system the program content of the NOR Flash is simply copied into the SDRAM and executed from there. The disassembled PLT VIEW makes use of one Hynix HY57V281620A SDRAM with 8M*16 size.